I've been wanting to drive one of these since those catchy TV commercials hit the air. 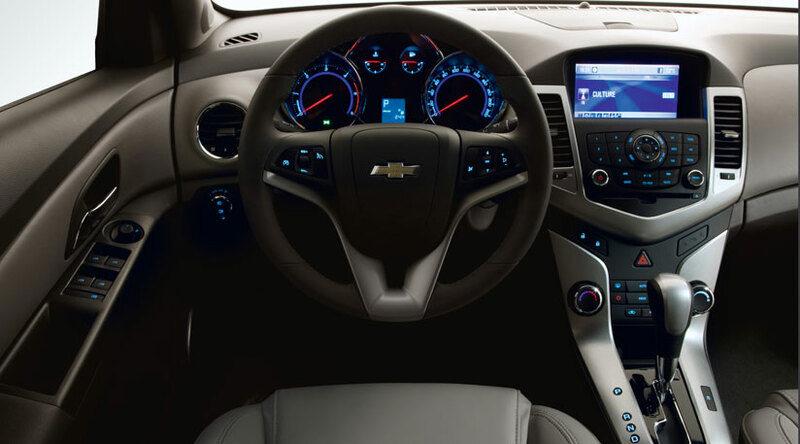 The 2011 Chevy Cruze is a good-looking small car, and I wondered if it really could live up to the implied promise that this was the future of the new GM. GREAT: The car is zippy, if not a bit buzzy. It has plenty of go, and none of that air conditioning lag that used to plague smaller engined cars. It's tight, fast, handles well and feels great at any speed. GOOD: It's well laid out, with lots of thoughtful touches like the handle inside the suprisingly very large trunk, 60/40 split folding rear seats, easy to read radio and console control centre, and a comfortable firm seating. ROOM for GROWTH: Heated seats, baby. That should be standard on any car sold in Canada. Heated seats are as much about safety as they are about comfort, in fact the two go together. WOULD I BUY ONE? Sure, if we were a young couple with a few little kids starting out, this would be a great car because of the roominess of the interior and the trunk. It's a great commuter car, great on gas and not bad looking. Maybe as an old retired geezer with a penchant for golfing, this car would do as well. As a highway vehicle, I'm sure it's fine but I'd really want to pimp it up with leather seats and a sunroof - taking it into a price range I'd prefer not to pay for a compact North American made vehicle.